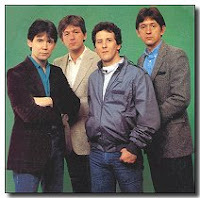 In 1977, the band members converted to Christianity. That same year they released their first Christian album, Song of Songs. Released without label support, it contained ballads and a mixture of pop rock. Their second album, This One's For You had a similar sound. Two years later, the band recorded Step in My Shoes. Devoid of up-tempo songs, the album was not commercially successful. For their fourth album, the band returned to a sound much closer to their musical roots. Almost Midnight, a rock album, was more successful than the first three. They continued with that sound for their fifth attempt, entitled Heaven or Hell. Benny Hester is a music artist and songwriter. He is best known for his chart-topping songs, "When God Ran" and top 40 crossover hit "Nobody Knows Me Like You". Benny has written and recorded more than twenty-five number one and top ten songs. Benny’s first single, “Jesus Came Into My Life”, was a breakthrough recording, becoming the first contemporary rock song to be universally accepted and widely played across all Christian Radio formats. The title track from his third album, “Nobody Knows Me Like You”, reached number one on the Christian Music Charts and became the first CCM song to break the Billboard Top 40 AC Charts. Walk up to your door and start to knock. Something I got to ask of someone else tonight. Though I don't deserve a thing, when you come into your kingdom, Jesus, remember me. Forgiveness I've got to ask from God himself tonight. Lord, when you come into your kingdom, remember me. And now in this moment I've found it.